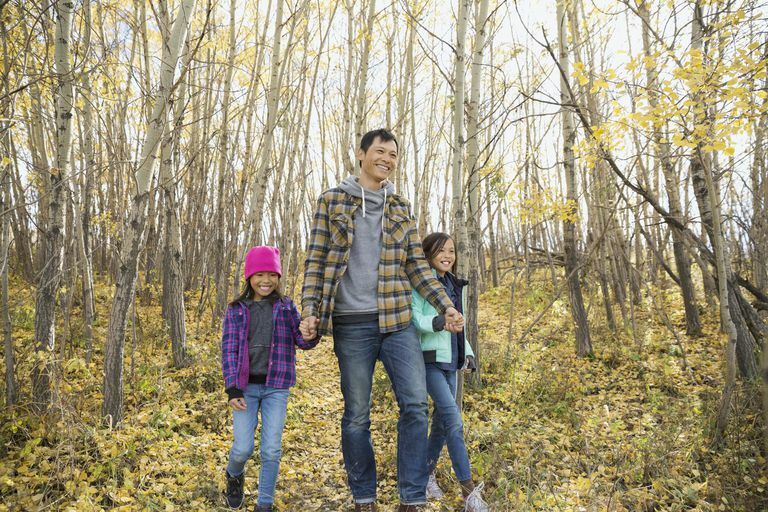 Don't let the end of summer mean the end of outdoor play—try these family fitness ideas for fall! Autumn brings new opportunities for outdoor excursions and other family activities. Get out and get moving in the crisp cool air. With the weather not too hot and not too cold, fall is the perfect time to explore parks, trails, and other local scenery. Online trail finders offer detailed information, including surface types, access points, locations, distances, and available services for trails in your area. The National Park Service has an online directory, too, search parks by name, location, activity, or topic (such as fossils, caves, or American presidents). Once you've found a fun destination, there are lots of fall activities to try! Walk, bike, in-line skate, or even ride a horse. Haul littler kids in a jogging stroller or frame backpack. Bring a camera and let kids snap their own shots. Gather fallen leaves to display or craft with at home. Try geocaching to add a cool treasure-hunting element to your outing. Don't forget the water bottles and gorp! Closer to home, turn fall yard work into family fun. Everyone knows that the best reward for raking leaves is jumping in the piles, and the bonus is that both the raking and the jumping get hearts pumping. If you have a preschooler, supply him with a child-sized rake so he can help just like the bigger kids. It's also fun to make mazes and trails in your leaves before you bundle them all into piles. Use a lawnmower or a rake to cut a path. Then have kids walk, run, or bike the course. Enlist kids to help with other seasonal yard work too. Give them some gardening gloves and have them yank out summer annuals. Demolition is so satisfying! (Just make sure they're clear on which plants are okay to pull out and which aren't!) The cooler months are a good time to plant evergreens, bulbs, and fall annuals like mums, so hand out shovels and let kids help dig some holes. Pick your own healthy treats with one of the most traditional fall activities: Visit an apple orchard! Apples are in season now and there are hundreds of homegrown varieties to choose from. Aside from the walking, picking, hauling, and leaf-peeping you might expect, apple orchards and pumpkin patches often offer all kinds of "agri-tainment." You might find a petting zoo, hayride, corn maze, or stack of hay bales to climb. Make a day of visiting a farm near you. There will be plenty to do, plenty to eat, and plenty to bring home too. Fall activities also include football! Take a cue from the gridiron gods and get outside for a game of touch football, or just play catch (equip little kids with a miniature or foam football). If European football (aka soccer) is your kids' fave, get out your net for a family game. No net? Pick two trees to approximate a goal, or improvise with cardboard boxes, traffic cones, or two-liter soda bottles. You can also adapt all kinds of outdoor games to include a football or soccer ball. Play the basketball classic HORSE using a soccer ball and net, or try kick the can with a football. Get creative, and get moving! Are You Making These Family Fitness Mistakes?